If you’re interested in running a charity abseil event, then this article will give you the information you need to set one up. 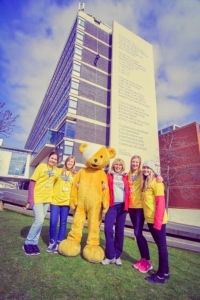 A charity abseil event is a great way to raise money for charity. Usually making on average between £4,000 and £40,000 a day depending on the location and the number of participants abseiling. Not only is it a great way to raise money, a charity abseil event is also a fantastic way of marketing your company or charity and getting some media coverage. This is often forgotten about and overlooked but it does add massive value to the event. If you’re an individual looking to organise a charity abseil event, then the best place to start is by contacting the charity that you wish to fund raise for and ask them if they want to get involved. If the charity wants to get involved, then they can help advertise the event and find extra participants. If the charity doesn’t want to help or already has a full fundraising calendar, then consider getting a group of people together as this will work out cheaper per person overall. If you’re a company or a charity and want to organise a charity abseil event, then it’s a very easy process as you have access to many potential participants through the office you work in, social media or by advertising in the local area. Even on the day of the event, people watching the abseil take place will want to have a go and will often ask if they can participate. This is another great way of adding an extra few people and bringing in more money and awareness for the charity. We provide everything that you need to be able to run a charity abseil event, but the first thing you have to do is find a venue that is suitable to host the event. 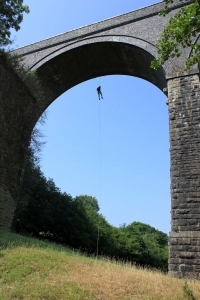 Abseils can be run nearly anywhere that is steep enough to drop a rope down. However, the most commonly used abseil locations are buildings as these are in urban areas and allow easy access for media and participants and also allow simple access to the top and bottom of the abseil rope. Local cliffs also work well, but if you live in London then these are not a common sight!! More and more abseil events are unusual or extremely high to set their event apart from others. Don’t be afraid to think about different ideas other than a building or cliff face – consider a dam, viaduct or bridge into free space, indoor abseils inside tall buildings, disused lift shafts or even down waterfalls! If it is a building, it needs a flat roof space. The line of the abseil should ideally be free of obstructions such as windows, balconies and lights. Newer buildings may be more appropriate to reduce the risk of older, deteriorating brickwork being further damaged. The edge of the roof/cliff etc. needs to be fairly solid (we always protect these edges and may use scaffolding to make it easier to get over the edge/parapets of buildings). 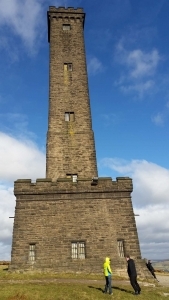 The area beneath the abseil will be cordoned off and will be monitored at all times. Once we’ve had a look through the photos, we will have a very good idea if the venue is suitable without the need for a site visit straight away. Once a venue has been selected, we will talk with yourselves and the building owner / manager to fix a date for the site visit and a potential date for the charity abseil event. If the building is suitable and a date has been fixed for the charity abseil event, then the next step is marketing the event and getting people booked on to do the abseil. We make this process as easy as possible. We will give you hour time slots throughout the day to allocate to participants booking on. We will even give you a PDF information pack that can be sent out to the participants; which gives them all the information that they need to know for the charity abseil event. Once the event is full, it’s time for the event day. All our events come with photos free on charge, so you can send them to the participants and use them for marketing. If you’re unsure on anything then please get in touch. Arranging a charity abseil event is as easy as finding a venue and getting people booked onto the event, we will run the rest. Everything is provided in the quote we give to you and there are no hidden costs.